Screenplay: Brenda Chapman, Mark Andrews, Steve Purcell, Irene Mecchi. Voices: Kelly Macdonald, Billy Connolly, Emma Thompson, Robbie Coltrane, Kevin McKidd, Craig Ferguson, Julie Walters, Steven Cree, Callum O’Neill, Piegi Barker, Steve Purcell, John Ratzenberger. Ever since “Toy Story” in 1995, Pixar Animation Studios have consistently delivered the goods. The only possible exceptions being “Cars” and it’s sequel. On the whole though, they have gained a reputation for delivering high quality and innovative story-lines. However, they have now reached a point where they are in danger of becoming victims of their own success. Nothing but the best is expected. This one attempts to go against their usual standard of storytelling and although some have criticism for it’s change of direction, I personally found it as appealing as ever. In the Scottish highlands, bold young princess Merida (Kelly Macdonald) defies and rejects the services of her mother Queen Elinor (Emma Thompson), who has arranged for her to be married. Merida would rather hunt in the forests with her skills in archery and when her mother refuses to back down on her betrothal, Merida flees from the kingdom where she seeks the help of a witch (Julie Walters). This impulsivity brings a curse upon Merida’s family and one that she must undo before it’s too late. Not only have Pixar changed their formula in having their first female protagonist in Merida, but they also had their first female director in Brenda Chapman. It was Chapman who conceived the project under it’s original title “The Bear and the Bow” but due to creative differences she was replaced by Mark Andrews. Added to which, Merida was originally to be voiced by Reese Witherspoon, who declined due to scheduling constraints. These post production issues could be the very reason why some critics claimed this film to be uneven. However, one of the silver-linings was the dropping out of Witherspoon as that meant that Scottish actress Kelly Macdonald could replace her. As it is, she’s perfectly fitting. What aids this film immeasurably is it’s authenticity in terms of it’s language and voice cast. It’s predominantly filled by Scottish performers and their delivery is pitch perfect. There are Scottish words and references peppered throughout, that although it’s not a requirement to understand them, the “patter” and idiom are well served and add a very personal touch that strike a chord and deliver many good laughs. 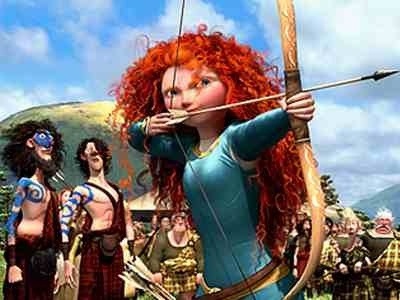 Some characters are certainly stereotypical but they’re fun and endearing nonetheless and surprisingly, for a Pixar movie, there’s a lack of furry animals and cuddly toys to grab the attention of children – although Merida’s three little brothers are adorable. What this mainly has, is heart, passion and the welcome change of a leading female character with a strength and independent spirit. The mother/daughter relationship at the films core, possesses a real depth that Pixar are not usually known for. 2009’s “Up” touched upon it but human relations don’t tend to feature heavily in their films. This is a different direction Pixar have taken but it’s not, altogether, an unsuccessful one. Admittedly, the story is a tad light and formulaic and ultimately, it gives way to the films colourful pallet. But what a pallet it is; it’s simply astounding. The whole film is exuberantly done and visually it’s an absolute kick in the eyeballs; from Merida’s flowing, fiery red hair to Angus her mighty Clydesdale steed and the vast, abundant, Scottish landscapes. The attention to detail is near flawless and it marks a highly impressive new achievement in Pixar’s animation. Okay, it might not reach the heights of the “Toy Story” trilogy in terms of imaginative storytelling but this is visually beyond anything Pixar has done before. At one point in the film, a character lifts up his kilt and playfully exposes his arse to another clansman, taunting him with the words “Feast yer eyes“. These are the very words that I would choose to recommend this sumptuous film… “Feast yer eyes” indeed. This entry was posted on August 7, 2012 at 11:57 am and is filed under Adventure, Animation, Family, Fantasy with tags 2012. You can follow any responses to this entry through the RSS 2.0 feed. You can leave a response, or trackback from your own site. I’ve heard some mixed reviews about this one, but I’m glad to hear you praising it, not the least when it concerns “the Scottish” in it. I’m a sucker for anything Scottish, from whiskey to mountain landscapes and bagpipe music, so I should check it out. It hasn’t opened here yet. I often enjoy film’s of a Scottish nature Jessica. Especially, if they’ve done their homework and don’t always reduce us to stereotypes. This film certainly has done it’s homework but they are subtle references that will probably only be caught by a Scot. For that, I have to applaud it. You must find certain film’s were there’s a Swedish understanding and appreciate them for it as well sometimes? It’s almost as if your in on a joke that you know most people won’t get. Thoroughly enjoyed this one. Agreed, Mark. Not Pixar’s best, by any means… but still a very very enjoyable, solid flick. I believe I gave it an A. It’s a great animated movie. It may not be the most original thing in history, but that doesnt make it bad. Cheers Man. Your words could have saved me the time on my review Fogs. I couldn’t agree more. Okay, the story wasn’t the most original but who cares when the animation was so good. I had great fun with this one. I’m thrilled that you love this one, Mark!! I’m most curious to hear what you think as you are Scottish yourself and you have a little girl, too. I so agree that Kelly was so perfectly fitting as Merida’s voice, boy I’m sure glad it didn’t work out w/ Reese Witherspoon, it just wouldn’t be the same! “What aids this film immeasurably is it’s authenticity in terms of it’s language and voice cast.” I absolutely agree and I love that Pixar invested in time and money for that authenticity. It’s one of my faves also, Mark. Definitely in my top 10 and I LOVE a lot of Pixar’s work. The music by Patrick Doyle is amazing also, he’s become one of my fave composers as well now. I adore Merida and the red-haired triplets!! I definitely would be buying the Blu-ray! I’d like to see it again as i wasn’t taking in much of the music somehow. I don’t know why? Merida was a great character though and the triplets were hilarious. It was just good all round family fun. What more are people really wanting here? Superb! I liked it a lot Tim. I think the naysayers have very high expectations if they say they never enjoyed this. The story isnt the strongest but that’s forgivable when everything else is spot on. not seen this yet, but i will and if i need an excuse i can take my daughter (but i don’t really – ha!). Pixar represent so much that is great about movies just by not allowing us to grow up! even when skilfully weaving in important themes. glad you reviewed this Mark, well done and great review. off now to watch Toy story 3 again I think! Cheers man. I really enjoyed this one. Like I’ve said in previous comments, it’s not perfect, mainly down to the formulaic story but it really enjoyable stuff. Not as good as Toy Story 3 (that’s one of the best) but still top quality Pixar for me. Great review Mark.. My girls were all empowered indees with my oldest wanting to make a bow and arrow an not feeling she needs to find a prince anymore, and my 2yr old sitting all the way through! To many princessess out there not knowing their own value, its brilliant we have a true representation of equality for the girls.. Even if its a market ploy to cash in on the post modern role of feminism its much needed and authentic to young girls.. Thanks for stopping by Tricky. I’m glad that it’s giving a true representation of equality for girls. Hopefully now, even Hollywood can recognise that females can successfully be the heart of stories without having them play second fiddle to dashing prince’s and knights in shining armour. Recently strong female leads have been creeping in to amerian cinema and it’s a trend that I welcome to continue. Oh, and can you get your eldest to make me a bow and arrow too? Fine review, Mark. Certainly, my thoughts on it tend to Ruth’s and your’s in rating this film. I’m glad you brought up voice casting in regard to this film and how it works as a strength in Pixar films. Too many times, in other studio animation films, they go with a ‘name’ star to help promote the film. Pixar, for the most part, has cast for ‘voice’ and what works better for the film. I daresay, if they’d have gone with Witherspoon, it would have been one of their miscasts. It’s one of the things that has kept me a fan of this studio. Language and accents are important (don’t get me started on some in film butchering accent in specific role — in my case, Spanish — it irks my ear no end). Like bad CGI, it takes the viewer right out of a scene because they note it. The bits like those you mention, that only someone well versed in the culture would notice, remains a hallmark for this studio. I, too, am puzzled as to the conflicting reviews on BRAVE. I rated it at 4.5/5 myself (on Letterboxd, BTW), which is none too shabby. The filmmakers went with the unexpected and succeed, at least for me (and Ruth, and you ;-)). I think you correct on the expectations Pixar success has engendered. Moviegoers are expecting perfect every time. And that will never work, for Pixar or the viewer. So glad to read your thought on this one, Mark. Keep’em comin’. Thanks for this. First off, thanks for your kind words Michael. Coming from yourself and the very high quality in which you write, I take your appreciation as the highest compliment. Like you say, being culturally aware does make a difference and in this case it certainly did for me. I’m was actually taken aback at some of the things they were aware of in Scottish culture. At one point (the witch) even refers to being away at “The Wicker Man” festival in Stornoway. This is an actual annual festival in Scotland thats not that well known but I have attended. This type of attention to detail, not to mention the use if words like “Galoot” are what separate the scots language from others. I doubt this would have been capable without the influence of the likes of comedians Billy Connolly, Craig Ferguson and Robbie Coltrane involved. They have stuck close to iconic Scottish people for their voice cast (Kevin McKidd even gets to speak in his dialect from Elgin – which, being from Glasgow, even I was bemused by) and for this reason the authenticity was captured perfectly. These references will go unnoticed by many but for me, it’s what really made me love the film. The Dreamworks studio deliver some good stuff but you’re right, it is always the (big) names they seem to go for. I really like Shrek and Mike Myers done a decent accent but that could have worked so much better had they employed Connolly for example. As I mentioned in my review, it’s a shame that Brave has to suffer in the public opinion so that Pixar can continue to produce film’s without seeming infallible because this film doesn’t deserve to to the flack. Good review Mark. This film was a bummer for me, but it was still a very lovely-looking Pixar film, and had some real fun to it as well. Problem is, as you have already probably heard from about 3,000 other critics who saw this movie, it gets real kiddie-ish, real quick. I can see why the shift in narrative may be too much for some Dan. I too noticed it, but I also went with it. It wasn’t ideal and I’d probably have been much happier had they continued as they’d started but when I went with it I still found enjoyment. As expected there had to be a kiddie element, otherwise Pixar would have fell into the category of “mature” viewers and would still have recieved criticism anyway. They are well known for their seamless blend of child and adult humour and maybe that blend wasn’t as seamless here but it was still a great little film. I think a lot if the criticism is unfair. Glad to see you liked this so well, considering some people seemed to be let down by it. I still haven’t had a chance to see it yet (somehow, I’m never able to see Pixar movies in the theatre), but I’m looking forward to it. I can understand why some would be disappointed but I had a lot of fun on this one Morgan. I hope you feel the same when you get around to it. Really wanted to see this one in theaters but missed my chance. Oh well, the blu-ray will have to suffice! It’s a shame you didn’t catch it Andy, its great on the big screen. Very visual as you’d expect from Pixar. I just watched The Incredibles last night and it really made me want to see if Brave is still playing at a budget theater or something just so I can see it. Thanks Fernando. Like i said to Andy, it’s a shame to miss it on the big screen but I hope you like it nonetheless. I’m so glad this passed the “Scottish” test with you, Mark. I’m looking forward to seeing this myself…. It certainly did pass the “Scottish” test Rodney. That’s what added to my enjoyment. Its a little treat. Thanks for stopping by man. I’d have to disagree with you on this one, sorry. I usually enjoy Pixar–and I’ve seen all but two of their films–but I just couldn’t enjoy this one. I’d say it’s for Pixar diehards alone. Sorry to hear you didn’t get much from this Alexander. I’d have to say it more likely that the die-hard Pixar fans are the ones slating this film. Expectations have been too high methinks. Either way, I still think it delivered. I’ll swing by yours to check your review later. Thanks man. I’m always late to the show when it comes to animated pictures. But this is one I’m convinced I need to see. Thanks for cementing it for me. I’ll be seeing it soon. As you probably know, a lot of people had less than great things to say about it Keith but this really hit the spot for me. Hope you like it. Awesome review! I’m really looking forward to this one, but I should probably see some other movies by Pixar I haven’t seen yet as Ratatouille which I hear is amazing. 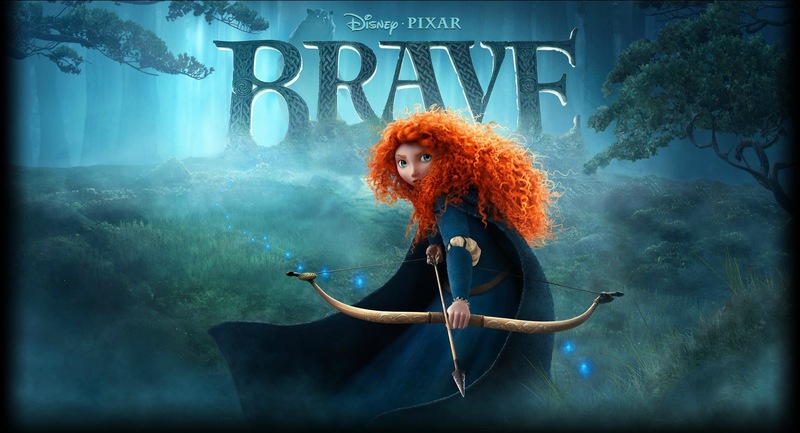 Brave looks wonderful to me because of that gorgeous animation and Merida’s hair which are just incredible. Didn’t even know Witherspoon was supposed to voiced her, so glad they hired Kelly instead. Thank you miss. Yeah, you should check out Ratatouille that’s very good. The animation on Brave is the best I’ve seen from Pixar so far though. They take it to another level and I totally agree about Kelly Macdonald getting the role. She’s perfect and adds a authenticity that Witherspoon could never have done. You already know this, the rules are rules. I’ve nominated you and your blogging for a Liebster Award. If you’re up for it, great! Otherwise, no worries. Thanks. Thanks to Michael and Alexander for the Liebster award. If I can find the time, I’ll pass it on but it may take me some time. I happy to recieve the recognition nonetheless. Cheers Scott. I can see the issues that people had but I still loved it regardless. I’m at that stage where I want to see it again now. while I found the story a bit mundane, my boy enjoyed it both times we saw the film, and that is sort of the point with a Pixar film afterall. I’m with you man. That flowing hair was amazing and even the detail in the spray coming of the waterfall. It had everything going for it visually. I can see the story being the weakest point but I just loved the humour and and the subtle Scottish references.